well sculpted from pale buff clay, the unglazed head with full rounded cheeks and finely modelled features, the hair pulled up into a tight double topknot and showing remains of black pigment, the lips showing traces of red, the broad-shouldered figure shown standing with arms held up in the posture of a falconer, wearing a long Persian style coat covered with dappled green, russet-brown and cream-white glazes, the wide cross-over lapels folded over and flaring out to the shoulders, the waist gathered in by a simple belt which is looped over and hanging down at the back, and wearing pleated pantaloons glazed russet-brown falling over the ankles, the feet in bright green-glazed pointed slippers with white toes, the rectangular base with splashed brown and green glazes running over from the sculpture. 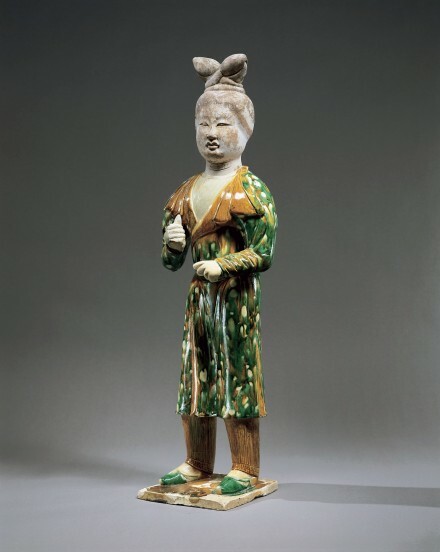 Compare the similar but smaller green and amber glazed attendant holding a bird, formerly in the collection of Alan and Simone Hartman, illustrated by Medley in the catalogue entitled Tang Sancai Pottery – Selected from the collection of Alan and Simone Hartman, London, 1989, no. 9, described as a woman in a man’s dress which the author states was the popular fashion for women of the Tang court when engaging in field sports. Figures of this type were also found on stone panels and on wall paintings of imperial tombs. Compare, for example, the figure engraved on a stone panel, excavated in 1959 from the mausoleum of Wei Zhong, younger brother of Lady Wei, the Empress of the Emperor Zhongcun, at Naliwangcun, Changan county, Shaanxi province, illustrated by Fontein and Wu in Unearthing China’s Past, Boston, 1973, p. 156, fig. 77 (middle) and again by Tregear in Arts of China, Neolithic Cultures to the T'ang Dynasty - Recent Discoveries, Tokyo, 1968, figs. 220 and 221, pp. 124-125. Attendants with similar headdresses and wearing the same distinctive costume appear in murals painted on the walls of the tomb of Princess Yongtai, dated A.D. 706, excavated in 1960 from Liang mountain, Jian district, Shanxi province, illustrated by Tregear in Arts of China, Neolithic Cultures to the T'ang Dynasty - Recent Discoveries, Tokyo, 1968, fig. 190, p. 112 and fig. 230, p. 131. Compare also the similarly modelled smaller green and amber glazed Tang pottery figures of attendants dressed in the Persian style, illustrated by Joseph, Moss and Fleming in Chinese Pottery Burial Objects of the Sui and T’ang Dynasties, London, 1970, no. 73, where it is suggested that the figures probably represent eunuchs.